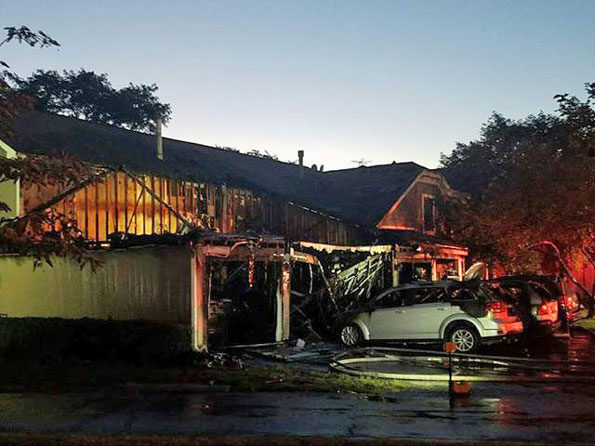 Schaumburg police and firefighter/paramedics responded about 3:20 AM Saturday August 12, 2017 to a report of an attached garage fire at a townhouse/condominium, 217 Oak Knoll Court Schaumburg, Il. The townhouse/condo building is located in the Lexington Green neighborhood west of Olympic Park in Schaumburg. Initially, no injuries were reported. A Schaumburg fire crew on arrival by 3:25 a.m. reported a fully-involved garage fire, and upgraded the call to a working fire response. Squad 55’s crew completed a primary search of the building, while engine crew members had two lines on the fire by 3:38 a.m.
A MABAS Box Alarm was activated just before 4:00 a.m.
Crews were monitoring for air quality and preparing for overhaul by 4:34 a.m. Squad 55’s were operating their air quality meter to check for safe conditions to all removal of firefighters’ self-contained breathing apparatus while inside the building. An interior crew reported air quality was good by 4:42 a.m.
Townhouse fire damage on Oak Knoll Court Schaumburg Saturday morning, August 12, 2017 (PHOTO CREDIT: Tim and Tara Monsen).